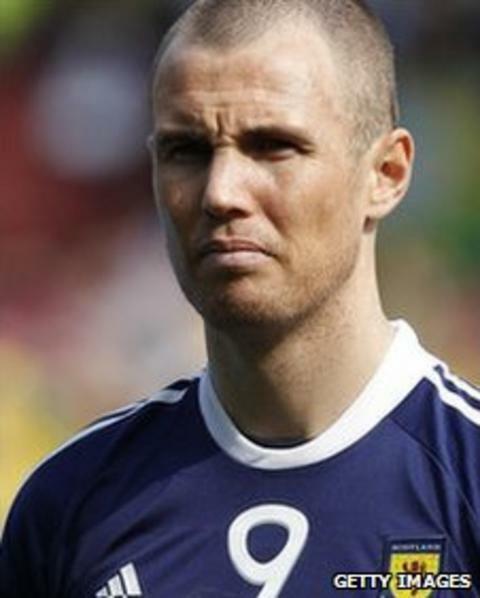 Former Wales striker John Hartson says that Kenny Miller would be an ideal signing for Cardiff as they rebuild under new manager Malky Mackay. The Scotland striker is negotiating personal terms after the Championship side matched Turkish club Bursaspor's valuation for the 31-year-old. "Kenny's a good player, he's someone who's played at the highest level," Hartson said. "I know him very well from playing up in Scotland with him and against him." Miller joined Bursaspor from Rangers last January for £400,000 but has failed to settle in Turkey. The Scottish Premier League champions offered the same fee hoping to seal Miller's return but Bursaspor have held out for more than twice that sum. But Hartson believes that Miller could go some way to filling the gap at Cardiff left by the departure of the likes of Jay Bothroyd, Craig Bellamy and Jason Koumas from the squad. "He [Miller] plays for his country, he's vastly experienced, a good player, plays wide, can play down the middle. Kenny would be a good signing," added Hartson, who played for clubs including Celtic, Arsenal and West Ham during his career. "You look at Kenny and Robbie Earnshaw, they're a good front two if you get them working together. "Malky Mackay has got a very difficult job there and I think he understands that. "I think the sensible supporters will understand it as well because they've lost 12 players, they've brought in six and they wouldn't be of equal quality. "I don't think the funds are there like it was last year with [former manager] Dave Jones and Cardiff may have to do a bit of a rebuilding process there, before they can start bringing in the likes of the Bellamys, the Koumases and the Bothroyds again. "Malky will understand all that, that would have been laid out to him before he took the job. I can see Cardiff having a difficult year really."